The building of Slovak Radio ranks in the top 30 buildings in the world even though many prominent architects designed its intriguing structure. If you like to see buildings with a difference, take a walk around to see its ‘inverted pyramid’ structure. The building has a concert hall and a large concert organ along with its function of being a Radio center. If you are in time for an event arranged here, don’t miss it! Ticket prices for events will vary. Timings of events will vary. Recommended time to visit is 8:00 am to 9:00 pm. How popular is Slovensky Rozhlas? People normally club together Jesuit Church and Slavin War Memorial while planning their visit to Slovensky Rozhlas. One of the most interesting building in Bratislava. Unfortunatelly it is really hard to get in and owerall shape of the building needs some renovations. I mean what can you say. 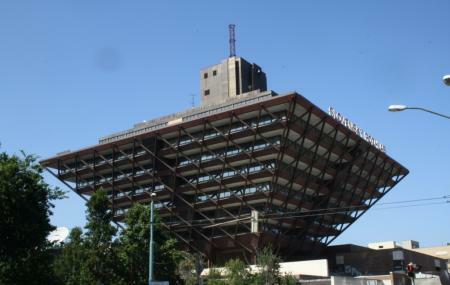 It's an upside down pyramid built during the communist period and you either love it or hate it. Well worth a look if just to see what you think yourself! We have been here for a New Year's concert of Bratislava Hot Serenaders and it was awesome. The ambiente is very socialist style but absolutely worth to see. It was for the first time that I was visiting a concert which was broadcasted live in a radio. Great experience. It's a beautiful and well-preserved building. I recommend guided tours. You will get to interesting places in the interior and hear about history.